Welcome again Greyhawk readers! This time I'm on the ball in promoting chapter four in our ongoing Castle Greyhawk graphic novel. Check out page-five to see some jilting jargon by Scott Casper. On our site you can also check the archives and follow the entire Castle Greyhawk story from the very beginning. Artist's Commentary: I don't know why I dragged my heels on this page, it was quite fun to draw. Scott has a definite romantic direction to this chapter and it's been fun to see Ehlissa again and in some lighter surroundings. Robilar undergoes yet another costume change this time in leather armor, but he's kept elements of his old outfits. The chain coif and the bracers from last chapter namely. Even when relaxing he is armed and ready. Let that be a lesson to poor Ehlissa. Ehlissa's stunned look was a great panel to create. She always has great expressions. This time though, I added some extra shading to really amp up her hurtful feelings. I can't wait to see where she runs off to in order to find Erac. Stay tuned! Once in a great while I look for new rules to spice up my ongoing Hold of Sea Princes campaign. I already use a heavily modified "frankengame" sailing and combat system borrowed from Basic D&D all the way through the editions to 5E. As I run mostly Pathfinder and now 5E, here is a couple online resources for others who want to run a 5E high seas/underwater campaign for Greyhawk or any fantasy world really. 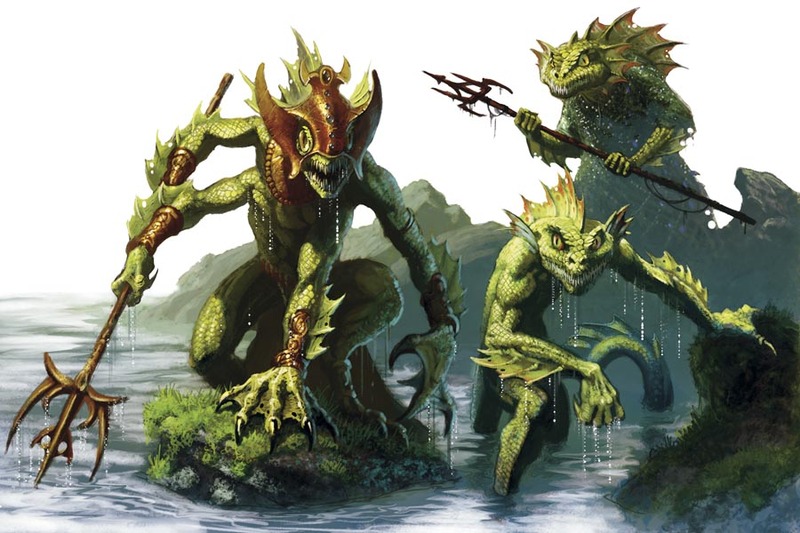 First up is some ready made 5E aquatic encounters from Limitless Adventures. These affordable, handy Limitless Encounter PDFs come in sets of 10 different encounters with varying levels of difficulty and are easy to reference for combat, roleplay or skill challenges. For a sea based campaign, the aquatic or urban sets can save a DM quite a bit of prep time between planned encounters. They are always adding new sets so check in often. I'm putting out a wishlist for a jungle and island set! Next up is the excellent site, Tribality who seems to be on the forefront of 5E ship rules as far as I'm concerned. I've incorporated more of their stuff so far than any other site. For starters check out their 5E pirate weapon article, and the excellent four part series on 5E naval combat. Their publishing arm even has a Pirate Adventures 5E PDF for sale. Get on this site now if you want to run a campaign like the Sea Princes. Welcome loyal Greyhawkers, today is the tenth installment of my ongoing 5E Hold of Sea Princes reboot of the 2E modules Five Shall Be One and Howl From the North, set in the south seas. What sort of high adventure will the crew of the Envy get into this week? Read on, and beware, this story may contain spoilers! When last we saw the crew of the Envy, they were in the port of Blue for some much needed repairs and some drunken revelry after having escaped the clutches of the sahuagin for the second time. Laying about a common room in the Low Tide Inn, they were roused by the familiar face of Cpt. Kendrick, the gun runner they had met a week ago. Handsome Kendrick welcomed them to his home port and admitted that he was in fact the leader of a faction called the Blue Port Confederation, independent pirates allied with the ruling Council of Three and the Slavelords. Kenrick extended an invitation to Cpt. Cullen and any other of his Sea Prince friends (or in Sabriel's case with benefits) to attend an important meeting of sailors from "their profession" at the home of one of the port's councilmen. He bid them good day and left the inn. Tyrrus at this point was still missing so Cullen went off in search of his strong man. The rest of the crew departed the inn to return to the pinnace to freshen up for the meeting later. Lash on the other hand had more pressing matters. He met with his sea-elf cousin Eristen at the docks where the two made side plans for a quick trip down the coast to the undersea kingdom of the sea elves in order to return the queen's long lost crown; recovered recently from the throne room of the sahuagin capital. Cullen found Tyrrus intact coming out of an alley hung-over short some money. His eyes widened however when a pair of street rogues bumped Cullen from behind and stole a pouch. The chase was on. Meanwhile in another part of town a ruckus was heard by Ostyn, Sabriel and Kuma as they walked toward the docks. In the market screams of "OGRE!" and an overturned cart of food had them worried. Sure enough, their friend Ogie had left the ship smelling food and was now being chased by three guards with crossbows. Sabriel yelled to the guards that it was her ogre to no avail so the trio gave chase as well. Sabriel navigated the crowd easily yet was in turn chased by a pack of yapping dogs, eventually overtaking the slower winded guards. Ostyn dodged around a crowd of peasants and beggars who had gathered for the spilled food but was also swift enough to gain. Kuma was athletic if not lucky and had bolted just in time to avoid the impediments Ostyn faced. Ogie lumbered along with fists full of food yet he heard and understood Ostyn's call to run for the ship. Doing so Ogie took a sharp turn down a side street. two of the guards gave up trying to stop the thundering beast while the third slowed for a hip shot at Ogie, the bolt whistling wide. Kuma bounded around the bend missing the wall narrowly, Ostyn kept rushing and Sabriel acrobatically leaped over barrels to continue the race to their vessel. The last guard started to run again after reloading, but a passing beer cart went in front of the ogre and next thing he knew Ogie had vanished. The others knew better and made for the Envy to scold their large friend as he gnawed on free food. On the other side of the quarter, Cullen and Tyrrus chased a thief who bragged his name was Speedy. Cullen indeed had trouble following Speedy, wagon after cart got in his way, he had to go around over and once under the vehicles to keep up. Tyrrus on the other hand caught up to the second thief once he crashed into an alley wall. After several stomach punches the man gave up and admitted he was part of the Blue Gang, the city's only organized crime faction. Indeed, the money Tyrrus got off him was not stolen technically, it was pay from his boss for collecting the protection money from other Blue citizens. Cullen too finally reached Speedy and with a quick draw and lunge stabbed him in the leg, dropping the nimble thief and the stolen purse. Cullen interrogated him and learned the same as Tyrrus. Threats were made to each other but Speedy was in no position to intimidate the cut-throat captain, he lived for now. The pair returned to the ship after their exercise and the whole party left that evening to meet with some other captains. At the house of Councilman Festerling, crews from many local pirate factions gathered to talk about the South Province's armada and their offenses to the code of the sea and a possible alliance with their old rivals the Iron League. Among them, Kendrick introduced the crew of the Envy to Captain Sasha Dirk of the Osprem's Kiss. the representative from the Lordship of the Isles. Dirk's scar over her heart only distracted from her grim stare at Sabriel and the others as they spoke to Kendrick. Dirk was a defacto rep from the Iron League and trusted few in the room, especially one Captain Davis of the Reaver. Most there were glad to see a crew from the Sea Princes and wanted their views to be brought west to Prince Jeon II. Cullen also had tense words of warning with the half-orc councilman, Brik whose Blue Gang is a security force of sorts. Amid the gathered discussion and arguments, Cullen tended to side with Kendrick on most matters which seemed to please him greatly. Then, the agent of the Crimson Fleet, Captain Anneka Folksan spoke; she had met the crew when they were still on the Sea Hag. Their battle at sea had gave her the captaincy of the Seahorse. She aptly mentioned a rumor that one of the legendary Blades of Corusk had been sighted. Most there knew of those blades in pirate lore and they wondered if it was an omen to unite and fight the Provincial Navy. Sabriel stood and drew Dreamsinger much to Cullen and the other's horror. The whole room was silenced but they knew somehow the Sea Princes must be on their side now. Kendrick ended the meeting so Sabriel could exit without much more attention, though an elven first mate swordsman did approach her to say he had last seen her rapier decades ago at a fencing school in Port Toli. The other Blade of Corusk he saw there was a great sword. They now had a lead. Off under the sea, Lash and Eristen went before the king and queen of the sea elf city of Mythlemora. Their exploits were heard at great length, the whole of their court were excited to know the sahuagin king was slain and his throne disrupted. What more the queen's crown was back on her brow. Feeling the importance of the occasion Lash then drew the longsword Stalker, another artifact gained from their quest in the sahuagin city. The sea elves were stunned in awe for the blue-black blade was known to their people in the past, when a nameless ranger once battled alongside them against the sea devils but was lost. The king had seen enough, he offered the low born ranger Lash the position of royal warden. Much to Lash's chagrin he looked at the black spot on his hand, a reminder of his quest to the Fivefold Council and kindly turned down the title. The queen didn't want Lash to leave empty handed, so for his modesty she gave him a magical crystal pendant that if used in dire need, would send for the aid of the sea elf nation. Eristen looked to Lash and informed him she would carry onward to Drawmij's undersea palace from here instead of returning to Blue. She advised he bring the crew back to the archmage so could look at the blades all together again. "You are glad to be in a familiar place, feeling at ease in this unreachable location. Yet, there is still a nagging premonition, as if danger is already lurking here waiting to spring out from the darkness to envelope you in maddening death." Sabriel's vision troubled her and she immediately felt unsafe in the palace, which then riled the others because her dreams usually came true. Drawmij tried assuage their fears claiming his magical wards and defenses, but went to check on them anyhow. Lash used Stalker to turn invisible and followed the wizard not trusting him. Ostyn searched about the palace looking for engineering faults in the strange undersea abode. The rest were led to Drawmij's game room to hopefully relax. 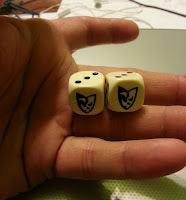 The room was fully appointed in furnishings and gamely diversions, but setting in the middle of one table lay a pair of dice bearing the symbol of Olidammara god of rogues. Momentarily forgetting possible danger, Tyrrus had heard tell of magical dice and cards so wondered if this wizard had such a pair. Picking them up he cast Olidammara's Dice and both faces came up on the comedy/tragedy mask, the worst result possible. Tyrrus recoiled and felt an emptiness as if his confidence waned or he forgot much of his training. Not daunted at all Sabriel gave the ivory cubes a chance and also was cursed by her result of four, she suddenly felt ill, as if weak. Kuma bravely grabbed the cubes and hoped his supernatural luck would pay off, and it did, as his total of ten granted him a greater understanding of everything. Cullen lastly felt pressured into trying his hand and merely gained some insight into his swordplay for a time being, which was good because throughout the palace a loud metal crash echoed through the halls. Some danger had indeed come to Drawmij's palace. Campaign notes: The guys got to play with my actual set of Olid's Dice (pictured above). The 3.5 rules on them required me to retrofit them to 5E rules. I was entirely amused that the first in-game roll came up double 1's. Poor Tyrrus did indeed lose a level permanently. And the others? Well I'll post my Olid Dice list another time in case Ostyn and Lash want to still try the dice. More later. Welcome back avid fans of the World of Greyhawk as I resume my ongoing feature titled "5 Reasons to Visit...". Be sure to go back and check my overviews of Nyrond, Keoland, Furyondy, Bandit Kingdoms and the Great Kingdom. Again, for most people who have played D&D you should at least be familiar with the classic adventures set in Greyhawk and possibly, some of you also know the setting's gritty details. With 5 Reasons I seek to put a spotlight on five good plots and places in (ideally) each of the nations of the Flanaess. Perhaps a new DM will be intrigued by these locations or an experienced one will be reminded or inspired to revisit these areas. As always, comments, suggestions and additions are appreciated. Enjoy! 1. Sybarate Island: The Hold of the Sea Princes is one of my all-time favorite locations to campaign. By now, I've written a ton of personal accounts, custom NPCs and city locales for my adventures set here. What's surprising however is that the Sea Princes already has some nice published adventure locations. One such place is Sybrate Island the smallest isle of the Hold and the setting for UK1: Beyond the Crystal Cave by Dave Browne, Tom Kirby and Graeme Morris. This 1E module for levels 4-7 is highly unique in feel from other D&D adventures due to it's Old English inspiration from places like Propherio's Garden to new characters like the Green Man. UK1 is also set apart because it's a module that also allows players to succeed without hack and slash. Crystal Cave was highly received by critics, but remained underrated in the Greyhawk community. UK1 did however some recognition in 2005 with a Hackmaster homage and a 4E D&D update. This little remote island can be a nice place to send players for a short, magical interlude. 2. Duchy of Berghof: Following on the heels of UK1 is UK2: The Sentinel and UK3: The Gauntlet both by Graeme Morris. TSR must've given Morris the undeveloped Sea Princes to be his playground cause nowhere in the hold is more developed than the charmingly remote Duchy of Berghof the setting for his "Adlerweg series" which involves a quest for two artifacts one of which is a glove. These two modules while not the best plot-wise, have some beautiful regional maps, that were quite unmatched in Greyhawk publication history for much of 1E and 2E. The Duchy was later updated for Living Greyhawk in an article by Paul Looby and Stuart Kerrigan. Moreso than UK1, Berghof is a fully realized subrealm within the greater Sea Princes nation. One could set an entire campaign based on these two modules and still have plenty of adventures to run in the neighboring Hold, Hellfurnaces or off Jeklea Bay. 3. Port Toli: The capital of the Sea Princes is the port of Monmurg. There is a lot that could be written or developed on this place, but the best we have currently is this unpublished map by esteemed Greyhawk author Gary Holian. In my own home campaign however, the most interesting city is actually Port Toli. In the base timeline of 576 CY, Prince Jeon II and his allies sought to end the slave practice that made their nation prosperous, so their main rival at the time logically had to be the prince of Port Toli. Toli is named for an old Keoish house who founded the port before pirates came along and conquered the coast and settled down. Port Toli is the best place for an urban-based pirate-themed campaign that runs on loose morals (at least before the Hold's unfortunate subjugation by the Scarlet Brotherhood in 584 CY). Port Toli is situated in a perfect place to strike out on voyages to exotic locales like the Amedio Jungle, the Olman Isles, the Hellfurnaces or even across the Azure Sea to yes, the Scarlet Brotherhood. In my own campaigns I've made this city of 11,000 into the ideal place to repair vessels, trade cargoes, sell loot, acquire rare contraband, conduct deadly duels and rub elbows with haughty evil nobles. The only thing it's lacking is a proper map. Anyone? 4. Hokar: Another city that is under-developed is the inland city of Hokar (22,000 according to the LGG). This place, due west of ort Toli always intrigued me for its location next to the Kamph Mountains nearby the aforementioned Duchy of Berghof. It's only canonical information comes post-Greyhawk Wars where its the capital of a resistance of ex-slaves and commoners rebelling against the occupying Brotherhood. I prefer to contemplate it's importance pre-Wars at the height of the Sea Princes nation. I've imagined this large city on the edge of the mountains, as a burgeoning mining town and given it's position, it has to also be a hub of trade between the main ports and all inland landowners as far west as Berghof. There is a lot one can do with Hokar as you can see, from urban to wilderness. As such I recently created my Mines of Hokar dungeon crawl campaign here and even created a town map to go with it. Does any one else have experience with Hokar? Feel free to add my campaign ideas to yours! 5. Westkeep: This city factors heavily into the history of the Sea Princes in their ongoing conflict with the rival kingdom of Keoland. The Siege of Westkeep saw the death of Keoland's King Tavish in fact. Westkeep's location on the edge of the expansive Hool Marshes makes it the best launching point for adventures or hunting expeditions in a swamp environment (indeed I7: Baltron's Beacon is set across the river from Westkeep). Post-wars, Westkeep is a strategic city that has become disease riddled and lawless during the continued overthrow of the Scarlet Brotherhood-controlled Sea Princes. Added to this bedlam, Keoland seeks to take Westkeep back from the foreign invaders before the disaffected Sea Princes can liberate their own land. Given all this danger and strife, Westkeep in any era is a good place for political intrigue and epic battle. Lastly I'd like to remind people that Greyhawk Reborn is a growing force in 5E convention play and their adventures are largerly set in the Sheldomar Valley and Sea Princes area. So for more on the Hold check out their site or attend their games at a con near you! Welcome back Greyhawk readers! Well now I'm not even trying. 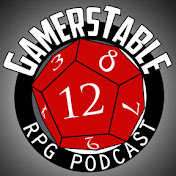 Somehow I'm two episodes behind in promoting chapter four in our ongoing Castle Greyhawk graphic novel. Check out page-three and page-four to see some alluring illusions by Scott Casper. On our site you can also check the archives and follow the entire Castle Greyhawk story from the very beginning. Artist's Commentary: So much to say about these pages that I must've forgot. At any rate, both pages should have been easy given Scott's minor use of dialogue. The pictures certainly tell the story of these two pages. Page three was a tough one for some reason. I think it was the "beat-panel" set up which I was out of practice on. Given I draw on paper, it's not always easy to "copy paste" a scene and make subtle adjustments. I did this a lot back during my comedic Greyhawk strips, but they were much less detailed. I ended up drawing page three twice basically. The first time I tried to be cute and draw the poses over a stock background but it failed. The second time I sucked it up and drew it all out and I'm glad I did. The expressions and gestures on Erac and Ehlissa are priceless. Page four was a different challenge.Scott wanted to do an homage for the late great comic artist Gene Colan. I was slightly disturbed that I did not know him when I'm such a Marvel fan. After some research I had indeed obviously seen his masterful work before. This page four "collage" is all black & white as a tribute to his style of illustration. It was quite a joy to draw if not a composition dream. I wouldn't mind having another crack at this style of art, I'm sure I could do even better. Astute D&D fans will also notice my other homage in this page. Enjoy! Semi-spoilers? Over at ENWorld, there is already talk, in advance of a June 1st announcement from Wizards, about a giant-themed story line rumored to be called Storm King's Thunder. There really is no reason to doubt the rumor as head-honcho Chris Perkins hinted at it long ago and the foundation of this story (set in Forgotten Realms of course) was likely laid out in Tyranny of Dragons. "Giants have emerged from their strongholds to threaten civilization as never before. Hill giants are stealing all the grain and livestock they can while stone giants have been scouring settlements that have been around forever. Fire giants are press-ganging the smallfolk into the desert, while frost giant longships have been pillaging along the Sword Coast. Even the elusive cloud giants have been witnessed, their wondrous floating cities appearing above Waterdeep and Baldur’s Gate. Where is the storm giant King Hekaton, who is tasked with keeping order among the giants? The humans, dwarves, elves, and other small folk of the Sword Coast will be crushed underfoot from the onslaught of these giant foes. The only chance at survival is for the small folk to work together to investigate this invasion and harness the power of rune magic, the giants’ weapon against their ancient enemy the dragons. The only way the people of Faerun can restore order is to use the giants’ own power against them." Forum discussion has been about the inspiration of Against the Giants the Greyhawk series by which all giant adventures are measured. Incidentally Chris Perkins did update AtG back in 4E with a fourth entry to boot, so there's that. What Perkins also hinted at was the hypothetical giant story being tied to Shakespear. Let the speculation commence on that, I know little of his works so any homage will be a surprise to me. A straight up dungeon crawl. It's well known. It is on the Sword Coast. It has plenty of monsters and subplots ready for an update. This is my favorite pick. This 2E module is by Wizards' own Bruce Cordell and involves the Far Realms which is very Cthulhuian, a niche that has many many fans. Firestorm Peak has some quirky villains which seems in line with Wizard's antagonists lately. It was also generic enough that it can fit in the Realms with little effort. A downed spaceship scenario isn't impossible given a Twitter teaser by Perkins once posted, involving a picture of a Froghemoth and other aberrant monsters. Would Wizards really mashup scifi and fantasy in Faerun though? The epic adventure boxed set has just the right components for a contemporary D&D mega event. It has demons, elementals and it has a multipart artifact quest. They'd be stupid not to consider the Ro7P. Still my favorite option. Liches are very popular and who hasn't heard of Vecna? Vecna has appeared in Ravenloft before so he has planar appeal. Also, when he is involved there is always a load of artifacts in play. This story would work even in FR since Vecna wants to supplant existing gods? FR deities are easy to push over! Here is a minor buried treasure I found among some old D&D materials I acquired over the years, a very cool TSR Dragon Magazine subscription form dated 1983. This is the same year the World of Greyhawk boxed set came out so I wonder if this was part of the set, I don't recall? What is awesome about this flyer is the art; a sleek dragon with some knot-work in the background. The piece is by the late Jim Roslof whose art you may remember from many classic D&D books such as Deities & Demigods or the cover to Keep on the Borderlands. As far as I can tell I've never seen this dragon illustration anywhere else. "Every issue of DRAGON Magazine is a treasure trove of ideas, opinions, and artwork designed to ut more :magic" in your role-playing game experience. Most of the articles are of special interest to players of the D&D and ADVANCED D&D games, offering them new rules and concepts to keep their fantasy gaming adventures exciting and challenging. 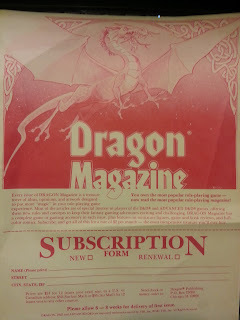 DRAGON Magazine has a complete game or gaming accessory in each issue, plus features on miniature figures, game and book reviews, and full-color comics. Subscribe, and get all of this for a rate of $2 per month - the most inexpensive treasure you'll ever buy." And of course, allow 6-8 weeks for delivery of the first issue. Good times! Oerth Journal #27 is Here! Your vision swirls still from the inky blackness of the deep sea, crashing into the sudden stillness of a blank void. Points of light come into focus gradually and you sense the seething bloodlust of the hunters as they restlessly hunt in all directions. Waking in fright, she ran to the aft of the Envy to tell Cullen of her dream. Just as the rakish rogue was about to dismiss her, she looked over his shoulder to see several large wakes in the water behind their ship and closing fast! Yelling for Lash, the sea elf wearily trudged up to see what commotion the bard was causing and that's when his eyes grew wide and he groaned. A sahuagin raiding party from the city was chasing them down, and this time they had brought sharks as transportation. The rest of the crew began to converge at the rear as Lash went the opposite direction. Eristen, their other sea elf companion then gasped and pointed as the largest wake was indeed a giant shark, what storytellers in the Sea Princes called a megalodon. Lash ran to climb the mast and get to high ground, his new weapon Stalker was attuned and he knew suddenly that he could turn invisible, the sea elf faded from view gradually like a shadowy mist. Captain Cullen remained at the wheel defiantly to try to out-maneuver the host, but the sharks were fast and the sahuagin too sharp to out-wit. Tyrrus busily enlisted Mallon the mage to help aim and fire one of their rear cannons. They had not spent much time practicing how to use the black powder weapons since acquiring the new guns, so the fighter and wizard bickered on how to point the weapon that the giant shark rose up first and bit a hunk out of the rail in front of them. Sabriel was concerned with the sahuagin raiders and sang a song of sleep, causing a few to fall off in pursuit. Ostyn retrieved his crossbow that he had left about for just this scenario and began firing at the attackers. Likewise, Ogie had a harpoon he was saving for just this occasion and he plunged it right into the hide of the unfeeling megalodon. Cullen continued to turn the ship and avoid the largest shark even as the smaller ones swam alongside their hull to allow their sea devil passengers to climb off to the side. Spears were thrown in advance of the boarders, one striking the preoccupied Tyrrus. Sabriel was also distracted by the huge shark and used her bardic powers to inspire the crew while viciously mocking the uncaring beast. Cullen looked behind him to see spears flying all around and invisible Lash's arrows zipping back at them from nowhere. Eristen stood by in defense of Cullen as webbed hands scrambled for the rail. Just then Tyrrus and Mallon finally got the point blank shot they needed, the cannon was lit and an ear-piercing blast blew a gaping hole in the giant shark. The smoke cleared and the monster was still unfazed, perhaps controlled by the evil will of its sahuagin masters. That will was tested by the ranger Lash Driftwood though. Again, using the special powers of Stalker, he was able to converse with the injured megalodon and though frenzied, he miraculously convinced it to calm and turn away without further harm. Meanwhile, Sabriel, Ostyn, Ogie and Eristen began to repel the boarding sahuagin, clubbing and stabbing them back into the dark waters, a handful reached the deck however, led by a fearsome four-armed baron. The sea devils frenzied and ganged up on Tyrrus who had just taken up his great sword. Bites and claws tore into the bleeding fighter and then the leader's trident pierced him for a painful lasting wound. Cullen tied off the wheel at last and dashed in with the rallied crew to defend Tyrrus. The lesser warriors fell easily yet the leader was tenacious and big as the ogre, his wicked trident deeply stabbing Ostyn's weapon hand at one point. Cullen circled and lunged back in to wear the leader down, while Ogie's huge club battered the creature to his knees. With a determined stab, Cullen finished the sahuagin off, ending the battle ended with all exhausted and bloody except Lash who appeared from the shadows. The next day the crew had finally got the rest they needed and came upon the relatively safe harbor of Blue Port, a pirate haven in the peninsula called the Pomarj ruled for life by a group called the Council of Three. The most notable feature of Blue they saw was the Dock Wall, a high wall and rampart lining their port, to defend the city from sahuagin attacks. This was surely a place that would be sympathetic to their cause. Upon arriving the party split up, Lash sold the pearls and other treasures gained from their undersea jaunt, Sabriel and Ostyn talked to the shipwright of the town about upgrades to their pinnace, while Kuma and Cullen separated to go wander the town alone. Tyrrus meanwhile took Mallon with him to the fish market to string up their catch of the day: sahuagin bodies including a four-armed specimen. The hatred the town had for the sea devils was great and most just spit on the carcasses, but eventually a wealthier local bought them for his own reasons. That evening Cullen was itching to get back to his old profession before hard times had found him on a crab ship then questing for swords. He had been carefully watching for a mark in Blue Port and found one that likely deserved his fate. From the shadows, Cullen jumped a haughty tax collector and his two goon guards in an alley. After intimidation for half their money or their lives failed, he slew one guard and gut shot the second, leaving him to bleed as an example. The tax collector for his worth did make the deal, handing over half the day's take. The man ran home, but was secretly followed by Cullen. That evening at the Low Tide Inn, the crew of the Envy and all in attendance were treated to food and drinks on Cullen. who had brought his own date to the celebration, the tax collector's daughter. The next morning the Low Tide Inn was quiet and hung over. Sleeping idly, Lash had cleaned up on side bets while snoring Ostyn had been the life of the party with his antics. Kuma, Mallon and Eristen were nowhere to be seen, having left the raucous party early. Sabriel had performed her bardic duties all night and now slept soundly in their common room. Tyrrus had got blitzed however, and eventually woke up in a totally different location; light on some coin to boot. Cullen also rested with a rare smile on his face in the arms of his new paramour, what's her name. Sabriel was then nudged awake by a boot. Gazing up with a sleepy frown she she saw a familiar face who had missed their party, the charmingly handsome Blue Port pirate Captain Kendrick. Campaign notes: Most of you probably haven't owned or read Howl From the North, the continuation of the five swords quest. Naturally since this is set in the south seas I am calling this adaptation "howl from the south", but the reason I bring it up is that HFtN is utter trash. It was written by a different author from Five Shall Be One so it loses a lot in the transition, failing to come through on promises from the first, as well as failing to capture the feel of FSBO in both adventure and the nature of the swords, and then there is the crappy NPCs and the infamous ending. The impending war backdrop is also sketchy. The author tried admirably to deliver on this threat but for well-versed Greyhawk historians like myself the story doesn't work. I'll rant on that another time. All you need to know for my campaign is that Howl From the South will bear little resemblance to this module except in the objects of the quest. More next time!